The distinctive shape of the leaves (a botanist may call it truncate-retuse!) 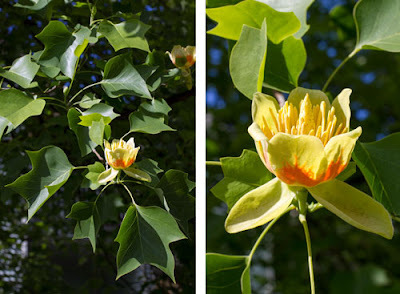 of Liriodendron tulipifera L. is quite unlike any other tree, and the tulip-shaped green and orange flowers in spring give the tree one of its common names - the Tulip tree. It is also one of the tallest (can reach over 50m) and straightest of deciduous trees, which in the right conditions can have a rapid growth rate when young. Consequently, it has a history of being an economically important timber product as well as aesthetically, extremely pleasing. If that were not enough, its pendulous leaves flutter and rustle in the slightest breeze (perhaps giving rise to another of its common names the Yellow poplar) making it, not surprisingly, a popular ornamental for centuries. In the Catalogue of Life Liriodendron is one of two genera (the other being Magnolia) in the primitive plant family Magnoliaceae. 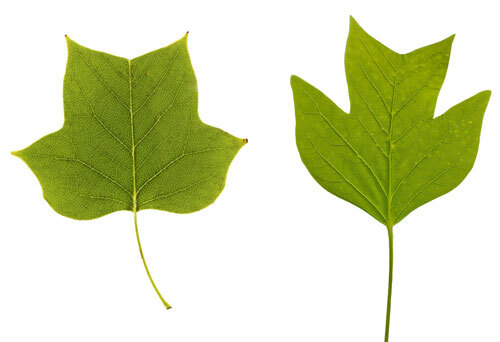 In terms of species Liriodendron is a tale of two halves: the aforementioned Liriodendron tulipifera is native to eastern USA, common, hardy, and widely planted in temperate climes; whereas Liriodendron chinense (Hemsl.) Sarg. is native to central and southern China and northern Vietnam, less hardy, and in its native habitat (montane evergreen broadleaved forest) is listed as near threatened by the IUCN Red List. There have been concerted efforts to preserve this primitive species in introduced habitats, for example a Tulip tree avenue composed of Liriodendron chinense can be seen in Kew Gardens since 2001. In the wild there are some protected areas yet how successful these measures have been needs reassessing. The disjunct geographical distribution of Liriodendron (ie opposite sides of the globe) is due to major geologic events causing separation in its ancient past. Where the isolation that occured led to each species evolving slightly different characteristics. Recent genetic research reports that the Tulip tree is the least evolved of any flowering plant currently assessed, having retained ancestral traits lost by other plants in its millions of years of evolution. As a result, this wonderful plant could end up helping explain the evolution pattern of all flowering plants.